Inventory We are a resale marketplace, not a box office or venue. Ticket prices may exceed face value. This site is not owned by Times Union Center . The Times Union Center is an indoor arena, located in Albany, New York, that can fit from 6,000-17,500 people, with a maximum seating capacity of 15,500, for sporting events. The arena also has 25 luxury suites, each having 16 seats, cable T.V., private bathroom, and private refrigerator, and are located at the top of the inner bowl. Suites are rented on a three-year lease basis (suites are currently sold out). The arena was opened on January 30, 1990 as the Knickerbocker Arena, with a performance by Frank Sinatra. The naming rights of the arena were sold to Pepsi in 1997 and it was known as Pepsi Arena from 1997-2006. 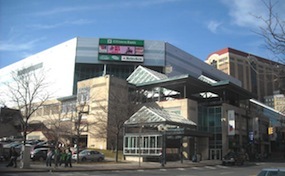 In May 2006, the naming rights were sold to the Times Union, a regional newspaper, and the name of the arena became the Times Union Center on January 1, 2007. TimesUnion.CenterAlbany.com is not affiliated with any primary box office or supplier. We are a privately owned and operated business specializing in sales in the secondary market. To buy tickets for any Times Union Center events in Albany simply click on the event of interest or call our operators at anytime.